The SSW-4 includes heavy-duty, gold-plated push terminals for cable connections, and the speaker’s mounting system allows for acoustic isolation from a wall framing. 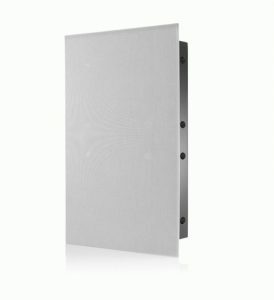 Its compact footprint provides easy installations without the need for installing a large enclosure behind a drywall. According to HARMAN, the subwoofer can discreetly integrate into any environment and décor, and can also be installed in a traditional application behind acoustic fabrics or woven and perforated projection screens, without having to install the grilles. The JBL Synthesis SSW-4 will be available this Spring for an MSRP of $1000.